The more solar observatories, the merrier: Scientists have developed new models to see how shocks associated with coronal mass ejections, or CMEs, propagate from the Sun—an effort made possible only by combining data from three NASA satellites to produce a much more robust mapping of a CME than any one could do alone. Understanding a shock's structure—particularly how it develops and accelerates—is key to predicting how it might disrupt near-Earth space. But without a vast array of sensors scattered through space, these things are impossible to measure directly. 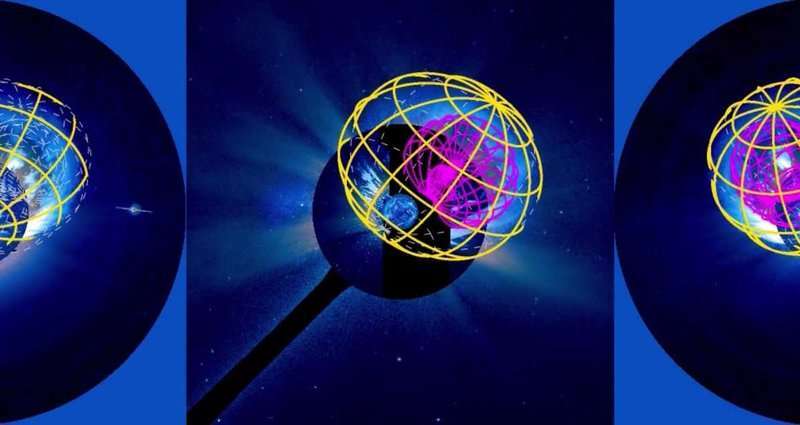 Instead, scientists rely upon models that use satellite observations of the CME to simulate the ensuing shock's behavior. The scientists—Ryun-Young Kwon, a solar physicist at George Mason University in Fairfax, Virginia, and Johns Hopkins University Applied Physics Laboratory, or APL, in Laurel, Maryland, and APL astrophysicist Angelos Vourlidas—pulled observations of two different eruptions from three spacecraft: ESA/NASA's Solar and Heliospheric Observatory, or SOHO, and NASA's twin Solar Terrestrial Relations Observatory, or STEREO, satellites. One CME erupted in March 2011 and the second, in February 2014. The scientists fit the CME data to their models—one called the "croissant" model for the shape of nascent shocks, and the other the "ellipsoid" model for the shape of expanding shocks—to uncover the 3-D structure and trajectory of each CME and shock. In time, shocks travel away from the Sun, and thanks to the 3-D information, the scientists could reconstruct their journey through space. The modeling helps scientists deduce important pieces of information for space weather forecasting—in this case, for the first time, the density of the plasma around the shock, in addition to the speed and strength of the energized particles. All of these factors are key to assessing the danger CMEs present to astronauts and spacecraft. Their results are summarized in a paper published in the Journal of Space Weather and Space Climate published on Feb. 13, 2018. The "shocks" as the article refers to are more accurately double layers. The energy transfer is not described properly with the mechanical interactions of the "shocks".